I remember when the Boy Scout stores began selling the Scouting Village pieces a couple years ago. I decided to start collecting them a little too late and missed out on getting the lighted Trading Post building. I still do not have one. When this year’s village pieces became available at our local Scout Shop I bought all three immediately. I did not want to make the same mistake a second time. I recently noticed that in addition to this year’s collection pieces, scoutstuff.com has an eight piece starter set available to purchase. The set includes all the pieces from 2012 and 2013, including the lighted Trading Post. So, in other words, I can now get the piece I am missing, if I am willing to spend $80 on the whole set. Since I have all the other pieces already, I do not think I will be doing that. I wish the scoutstuff.com website would make all the pieces available as single pieces. It is obvious they are manufacturing the pieces again, otherwise why wouldn’t they have offered the pieces online earlier to clear out inventory? I am sure I am not the only one who missed out buying a building during the last two years, or maybe I am. I does frustrate me a bit, almost to the point of thinking that this will probably be the last year I will collect the Scouting Village pieces. It is a great idea to offer the set to new collectors, but I feel it is a slap in the face to those of us who began collecting two years ago. What do you think about it? YouTube Tuesday: Think You Know Scouting? Today, for Youtube Tuesday, we are leaving the USA and the BSA. The UK Scout Association has produced a great video that does a great job of promoting Scouting and asking adults to volunteer in their local units. What I find fascinating is most of the information in the video could apply to the Boy Scouts of America. This video was uploaded in October 2010. Check it out and let me know what you think about it. 100 Days of Scouting: Day 57. The Boy Scouts of Melrose Troop 68 were a little nervous when they arrived at the Melrose City Council meeting. They really did not know what to expect, and neither did I as their scoutmaster. The troop was at the meeting because the city council was going to pass a proclamation recognizing the 100th anniversary of the Boy Scouts of America and the 30th anniversary of Boy Scout Troop 68. 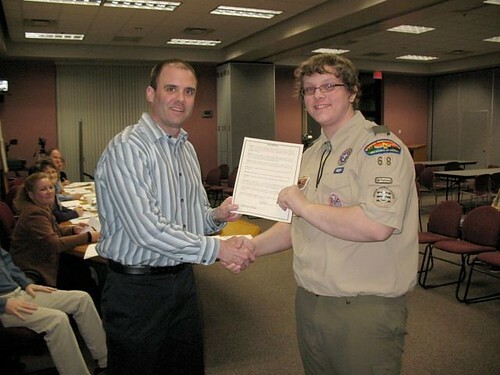 When the time came for the city council to pass the proclamation, the city’s mayor, Eric Seanger, spoke a few words about how the city appreciates the hard work of the Boy Scout troop. He then invited a member of the troop to come forward to accept the proclamation. Our senior patrol leader received that honor. I took a couple of pictures, one which ended up in the local paper. Unfortunately, because the council had to attend another meeting with the local township boards, they did not have time to read the proclamation. Since we had an outing the following weekend I recruited a few Boy Scouts to read it in front of the video camera. I received a copy of the city council meeting from Mel-TV, our community access television station, and went to work editing everything together to make this video for the Melrose Scouting Production Podcast. Unless you have been hiding in a cave somewhere you have probably heard that the Boy Scouts of America are celebrating their 100th anniversary this year. The United States of America Congress granted a charter to create the B.S.A. on February 8, 1910. Since that day there have been over 100 million boys who have joined the organization. The B.S.A. has been planning some fantastic events to celebrate the anniversary. There has been a colorful float in the Rose Bowl Parade, a partnership with Dale Coyne Racing, the historical merit badge program, and the upcoming 2010 National Jamboree, just to name a few. Councils, districts, packs, troops and crews are also planning special events. I have an idea. Let’s try to bring this to the public eye in another arena. Online. On YouTube. Let’s pick a couple videos that have a Scouting theme and then, on February 8th, we have our Scouts, families, and friends watch those videos. Let’s see if we can’t get enough hits that day to bring those videos to the YouTube front page. Could we make one or two videos go “viral”? If this is to work we need to get the word out to as many people as possible. We will need the involvement of packs, troops, and crews. We will need the councils and districts to spread the word. We need blogs to blog about it and people on Twitter to tweet about it. We will need hundreds of thousands of people to watch these videos on February 8th if we are going to make an impact. I would like to make a few suggestions for the videos we could watch: one B.S.A. promotion video, one video showing Boy Scouts performing a skit, and one showing Scouts having fun on an activity. If you have a suggestion please leave a comment below. The B.S.A. Promotion video – This one was suggested to me when I asked for suggestions on Twitter. It is titled “Feel Proud” and features Cub Scouts and Boy Scouts doing community service projects to a catchy musical tune. Boy Scout Skit – I am choosing a skit which is one of my favorites, The Furniture Store. This video was performed by the Boy Scouts in my troop during one of their community shows. Scouting Activity Video – I thought this was a cute video of Cub Scouts doing their version of the Cub Scout Promise, rap style. And it is only a minute long. So there you go. Get out and spread the word! And watch video on Monday, February 8th.